Right: Work with your community assets. 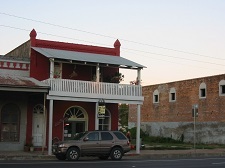 Calvert, Texas, U.S. at dawn. You know, the economic development issues in Mozambique could be quite different from what perplexes community leaders in Los Angeles. While temporary but wrenching economic upheavals seem to occur periodically in Asia, Europe, and the U.S., other "less developed" parts of the world simply continue to suffer from the ups and downs brought on by drought, disease, war, poverty, and ethnic or religious rivalries. By attempting to serve all sizes of communities and to allow the international community to make gentle corrections to our admittedly very U.S.-centered experience, we hope that all peoples can learn from one another and appreciate their own good fortune and culture. As we try to bring out through this site, the goal of economic development is not confined to a consumer-led economy. We think any discussion of economic development issues should consider also the links between a satisfactory standard of living for all social classes and the ability of all peoples to contribute meaningfully to a society. Many of the good things available to human beings, such as discovery, the arts, and idea sharing, only happen when education is universal and when disease and prejudice are held in check. Some degree of well-being in health and education is a prerequisite to very much accomplishment in economic development. From the standpoint of the greater social good, it is critical to spread wealth widely among the population instead of concentrating it in the hands of a few. Even when education and health levels are high, a local economy can face challenges due to automation, obsolescence due to technology advances, extreme weather events, and setbacks to large employers or institutions that the city was dependent upon. So even with the best local planning, we see that economic development issues can arise at any point. We encourage you to complete the form below to ask your question. You can remain anonymous if you wish. We select the questions we can understand and answer at least in part. Other site visitors are welcome to comment and help answer questions as well. These are edited for clarity, and then the question and its answer are published as a separate page, which will be reached from a link below. Don't worry about whether you're in the correct category of the community development question section of the website. We can fix it if we think another category will work better for you than this one. Do you have a question for other visitors and the editors? This is a good place to bring up burning issues about how your community can create income from the outside world. Then you watch for the answers to appear on the web. Give us enough detail so the answer is helpful. Just type here. We edit as needed, but there is plenty of room for you to expand on the situation if you have a long question. Do we need to see a picture to understand what you're saying? Click the button and find the first one on your computer. Select it and click on the button to choose it. Click below to see questions from other visitors, and answers they receive.